For some reason I have a very out of sorts the past couple of days. I haven't felt well, I have been unmotivated and I have been really missing my Mum and Dad. It has just gone 2 years 9 months since Mum passed away and 5 months since Dad has gone and the past couple of days it has gotten to me a bit. So today I thought to myself - self what would Mum say if she was here? She would say just get up and do something, keep you mind active!! So after working this morning I came home and decided to sit in the studio and just make some bracelets without really thinking to much about anything. I ended up making five and even though they are not mind blowing original masterpieces I'm really happy with how they turned out and they did give me something to think about other than my feelings. I think they are lovely, Davine. What great therapy! 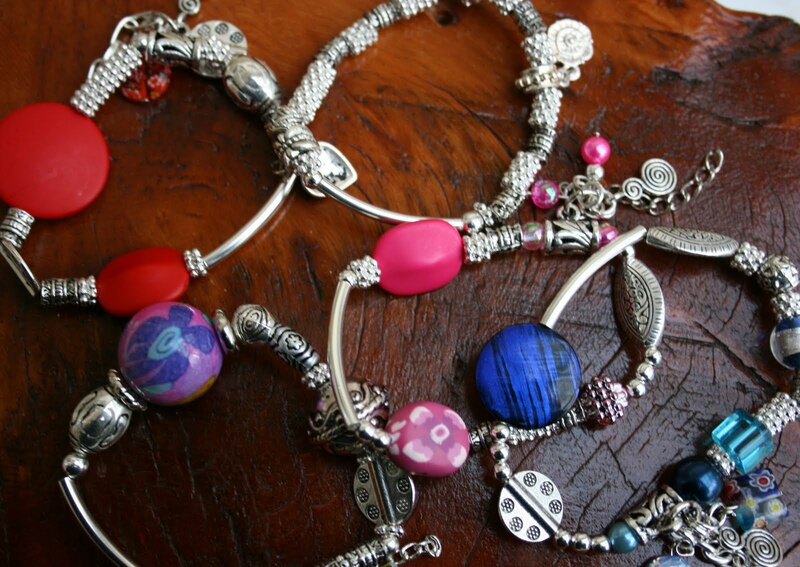 I think that these are wonderful bracelet Davine, that's good to put your hands to work instead vs. the alternative. Maybe you just need a good old fashioned cry and let some of those feelings escape.... maybe, I'm no psychologist but I know that works for me when I get to the point when I really miss my Mom. Have a fantastic weekend, see you sometime next week! Your bracelets are beautiful!! It's ok to morn/cry...it really hasn't been that long. I am your age and my mom died in 1968 and my dad in 1998 and I never know when my sadness will hit me. Davine, a beautiful way to help distract the way you feel. . . not easy I'm sure! There will always be moments when you will miss them, regardless of the length of time, but what you achieved was really positive. Really like your bracelets, particularly the one with the mauve bead, but then amethsyt is my birthstone colour. Brilliant! Take care, & have a lovely weekend!